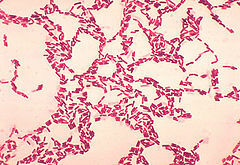 Bacillus coagulans is a lactic acid forming bacteria. It displays behaviors common to both Lactibacillus bacteria as well as Bacillus and was only recently transferred from genus Lactobacillus to Bacillus. There are also references to use of this bacterium in humans, especially in improving the vaginal flora, improving abdominal pain and bloating in Irritable Bowel Syndrome patients and increasing immune response to viral challenges. The bacterium has also been assessed for safety as a food ingredient. Spores are activated in the acidic environment of the stomach and begin germinating and proliferating in the intestine.